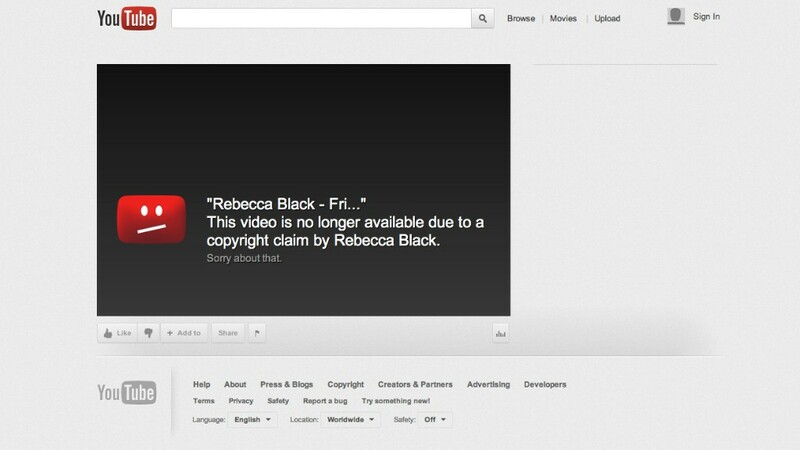 YouTube gets a constant barrage of take-down requests related to copyright violations. In a new campaign that started Monday, Google is cracking down on copyright violators that show up in its search results. But at least one site that hosts a mother lode of pirated material won't see much of a change: Google's own YouTube. As part of the Digital Millennium Copyright Act, copyright holders can request that Google take down search links to URLs that point to pirated material. Google (GOOG) is adjusting its search algorithm to factor in the number of take-down requests it receives. "Sites with high numbers of removal notices may appear lower in our results," Amit Singhal, Google's head of engineering, said in a blog post. "This ranking change should help users find legitimate, quality sources of content more easily." The websites most likely to be ranked lower in Google's search are sites like FilesTube and torrentHound, which topped Google's take-down request list last month. Both sites give users ways to download copyrighted material for free. They're pretty blatant -- torrentHound even advertises pirated copies of in-theaters movies like The Dark Knight Rises and The Amazing Spider-Man. YouTube also hosts a huge amount of pirated material and receives numerous take-down requests; Google wouldn't discuss the exact number. However, YouTube is expected to emerge unscathed from Google's search change. Google insists there's nothing nefarious going on. The company puts each website it crawls through about 200 different filters, and both YouTube and torrentHound are subjected to the same exact screening. YouTube's heft -- and the fact that millions rely on it for completely legal video-swapping -- will keep it from sinking in the search rankings. Google wouldn't detail how its various ranking tests work, but a company spokesman said the intent is to promote the sites that users want to go to, including YouTube and other popular, user-generated content sites like Facebook (FB), Tumblr and Amazon (AMZN)'s IMDB. Google is being especially cautious about this subject, since the company is the target of ongoing antitrust investigations in both the United States and Europe. Those probes are looking at whether Google unfairly promotes its own content above its rivals. That may be one reason why Google is holding its own sites, including YouTube and Blogger, to extra-strict standards. When tallying up the number of take-down requests for its own sites, Google is counting both the search-related take-down requests it receives as well as YouTube and Blogger's own, separate copyright-related take-down requests. That's something Google can't do for sites like Facebook or Tumblr, since it doesn't have access to take-down requests sent to those companies. Even with that exaggerated number, Google said YouTube's search results rankings shouldn't appear much different than they have in the past. "It's not because we're hand-picking anything," a Google spokesman said. "Generally speaking, we're about promoting what's relevant to our users."